You can now be the king or queen of the road if you buy the Bentley car which was previously owned by the king of music, George Strait. 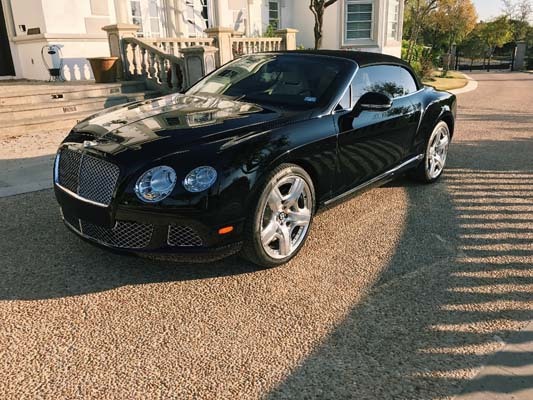 Reports have disclosed that a 2012 Bentley Continental GTC convertible that was previously owned by the country music singer is for sale, and it comes with an autographed car manual. The luxurious car is currently on the market for $159,000. It has apparently only done roughly 13,000 miles and comes with cream coloured leather seats, navigation, and multi-zone climate control. These are, of course, just a few of its features. The current seller of the vehicle, Rolando Cisneros, is the country music star’s neighbour in San Antonio. He apparently purchased the Bentley from Strait a few years ago for a little under $200,000. The trader that’s dealing with this sale has described it as the “perfect first car”. The car has been viewed online over 40,000 times so far. Strait signed the owner’s manual when Cisneros bought the car. He apparently also offered to sign the dash for his San Antonio neighbour. Although Cisneros decided to pass on that offer. If you are interested in purchasing the country music king’s old ride, you may want to jump on the band-waggon fast because according to Cisneros, his phone is ringing off the hook with people begging him to accept their offer. These offers are apparently flooding in from all locations across the globe. However, if you don’t have enough cash put away to purchase Cisneros’ Bentley, then why not hire one from us at Limo Broker today? We offer a range of motors for hire, and have exceptional experience to meet all of your travel needs. If a Bentley isn’t up your street, take a look at our other options and request a free quote today!